You can use the Select menu in Photoshop Elements to further modify and refine selections by expanding, contracting, smoothing, softening, inversing, growing, and grabbing similarly colored pixels. The Select All and Deselect commands are no-brainers. To select everything in your image, choose Select→All or press Ctrl+A (cmd+A on the Mac). To deselect everything, choose Select→Deselect or press Ctrl+D (cmd+D on the Mac). You usually don’t have to use Select All. If you don’t have a selection border in your image, Elements assumes that the whole image is fair game for any manipulation. If you take the time to carefully lasso around your desired object, you don’t want to lose your selection before you have a chance to perform your next move. But all it takes is a mere inadvertent click of your mouse while you have an active selection border to obliterate your selection. Fortunately, Elements anticipated such a circumstance and offers a solution. If you choose Select→Reselect, Elements retrieves your last selection. The Reselect command works only for the last selection you made, so don’t plan to reselect a selection you made last Tuesday or even just five minutes ago, if you selected something else after that selection. Sometimes, it’s easier to select what you don’t want rather than what you do want. For example, if you’re trying to select your beloved in his or her senior photo, it’s probably easier to just click the studio backdrop with the Magic Wand and then inverse the selection by choosing Select→Inverse. You can feather a selection when using the Lasso and Marquee tools by entering a value in the Feather box on the Options bar. This method of feathering requires that you set the Feather value before you create your selection. There is a way to apply a feather after you make a selection. Choose Select→Feather and enter your desired amount from 0.2 to 250 pixels. Your selection is subsequently softened around the edges. Smooth: Reduces jaggedness along your selection edges. Feather: Moves the slider to create an increasingly softer, more blurred edge. Contract/Expand: Decreases or increases the selected area. Background icons: Enables you to preview your selection in Standard or Overlay mode. Click the custom overlay color button to preview your selection with your edges hidden and a semi-opaque layer of color (that shows onscreen only) in your unselected area. Double-click this icon to change the color and opacity of the overlay. Press F to cycle between standard and overlay views. And press X to hide your selection edges. Zoom tool: Allows you to zoom in to your image to see the effects of your settings. Hand tool: Enables you to pan around your image window to see the effects of your settings. Fine-tune your selection with Refine Edge. The Grow and Similar commands are often used in tandem with the Magic Wand tool. If you made an initial selection with the Magic Wand but didn’t quite get everything you want, try choosing Select→Grow. The Grow command increases the size of the selection by including adjacent pixels that fall within the range of tolerance. The Similar command is like Grow except that the pixels don’t have to be adjacent to be selected. The command searches throughout the image and picks up pixels within the tolerance range. These commands don’t have their own tolerance options. They use whatever Tolerance value is displayed on the Options bar when the Magic Wand tool is selected. You can adjust that Tolerance setting to include more or fewer colors. 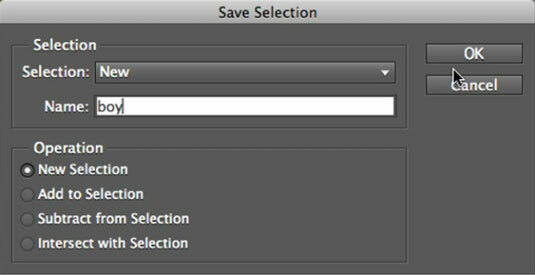 After you perfect your selection, choose Select→Save Selection. The operation is automatically set to New Selection. Save your selection for later use to save time and effort.